Psychotic disorders often are severe and involve extreme symptoms such as delusions or hallucinations in which people lose their sense of reality. Researchers at the University of Missouri recently found evidence that boosting how well people at risk for psychosis learn from positive and negative feedback could potentially keep psychosis at bay. The team also found that brain scans using functional magnetic resonance imaging, coupled with behavioral measures, could provide markers for the diagnosis of psychosis risk. Researchers hope findings will help mental health professionals to understand how to better treat their patients with psychoses and prevent the onset of psychosis. "Around the time Nobel Prize winner John Nash first developed psychosis he turned down an endowed chair at the University of Chicago because he said he believed he was going to become the emperor of Antarctica— despite the population of Antarctica being zero," said John G. Kerns, professor of psychological sciences in the MU College of Arts and Science. "How a genius like John Nash could develop a delusion has long baffled clinicians and scientists. We wanted to examine whether dysfunction in a brain region called the striatum and a disruption in feedback-based learning were related to risk for psychosis." Feedback-based learning helps learners raise their awareness of strengths and weaknesses and identify actions to be taken to improve. It is heavily dependent on varying levels of dopamine, a neurotransmitter that sends signals to other nerve cells, specifically located in a specialized part of the brain called the striatum. Dopamine in the striatum provides an important teaching signal that increases or decreases the chance that certain thoughts and actions occur again in the future. In research conducted at the Mizzou Brain Imaging Center and using a feedback-based learning task, Kerns and his team found that people at risk for psychosis are impaired when they need to rely on feedback to learn. 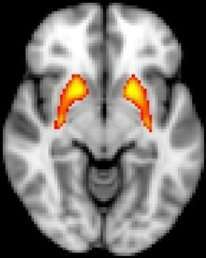 Using fMRI brain scans, the team found that people at risk for psychosis failed to activate the striatum when they received feedback. "Current research suggests that people like John Nash develop delusions in part because they have problems learning from feedback, like a car driving without a brake," Kerns said. "Our research is also consistent with other research that people with psychosis have an increased level of dopamine in the striatum. However, for the first time we have linked psychosis risk to both a behavioral impairment, poor feedback learning, as well as striatum dysfunction." It is also hoped that this research will be useful in detecting risk for psychosis, Kerns said. Measuring dopamine in the striatum is both invasive and expensive and cannot be done in routine clinical assessment. However, Kerns found that non-invasive measures can be used in every day clinical practice to effectively detect striatal dysfunction. Ultimately, Kerns believes this research will help professionals both detect risk and prevent psychosis, which could mean decreased suffering for many people and their families. The study, "Probabilistic Category Learning and Striatal Functional Activation in Psychosis Risk," was published in the Schizophrenia Bulletin. Ice psychosis—what is it, and why do only some users get it?